More than 38 million American households will purchase a cold beer this summer, making beer the preferred choice over all other beverage alcohol for summer occasions like backyard barbecues and ball games with friends and family. In the 15 weeks between Memorial Day and Labor Day in 2013, beer and malt beverage sales topped $11 billion, making it one of the largest selling categories of all food and beverage channels according to Andrea Riberi, senior vice president at Nielsen. In addition to being a responsible choice for moderating consumption, beer means big business for communities across the country. According to an economic study jointly commissioned by the Beer Institute and the National Beer Wholesalers Association in 2012, U.S. brewers and beer importers support an industry that puts more than 2 million Americans to work. 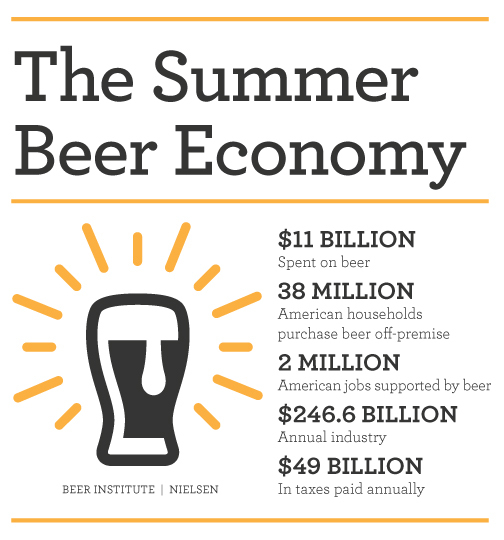 Beer also contributed $246.6 billion to America’s economy and generated $49 billion in local, state and federal taxes. In fact, more than 40 percent of what consumers pay for a beer goes to taxes, making taxes the most expensive ingredient in beer today. For information about the economic impact of beer in the U.S., including state and Congressional district data, please visit http://www.BeerServesAmerica.org. The Beer Institute is the national trade association for the American brewing industry, representing both large and small brewers, as well as importers and industry suppliers. First founded in 1863 as the U.S. Brewers Association, the Beer Institute is committed today to the development of sound public policy and to the values of civic duty and personal responsibility.